The pursuit of happiness is an important right in the declaration of independence. As it turns out, there is more to it than just a phrase in the 1776 document. Now, that notion is a recognized measurable gauge of community and individual well-being. How this relates to our pursuit of better process in planning Tucson’s core is the measure of social capital necessary for effective and harmonious action. 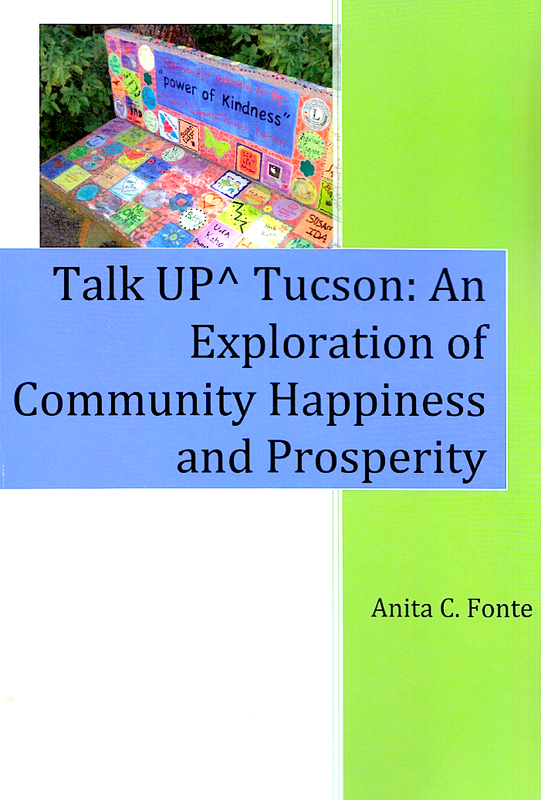 Anita Fonte talks about that in her new book, Talk Up Tucson: An Exploration of Community Happiness and Prosperity, The book focuses on an internationally known concept that links levels of happiness and prosperity to our well being. The book reflects on Anita’s Tucson experience and the work of her company, Community Renaissance. Following consulting work with Kimley-Horn and the RTA, she decided to write. From talking and meeting with community leaders and people in Tucson’s development world she published comments and conclusions that gauge our social capital in building a more inclusive process thereby, more “happiness” for everyone. Her book is available at Antigone Books and Mostly Books.